After a predictably exhausting trip across Kensington, then across Calgary, then across Canada, then across Nova Scotia, we have landed in our new town. Next week (we hope) we make the final move across the village to our house. Before then, we have some painting, planning, repairing and replacing to do. Fun stuff, but I am going to be trying to make myself useful to present and future clients while we do it. We'll see how that goes! 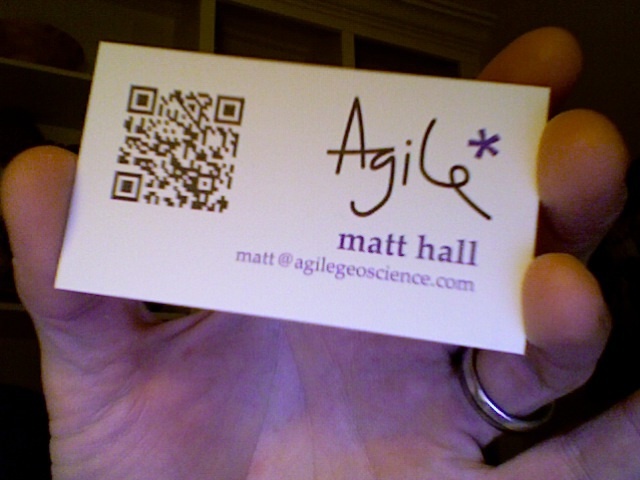 In the meantime, I got my new business cards just before we left Calgary. They are a bit home-made, but I like it that way. The geeky 2D barcode thing is a QRCode, and very easy to make online (just Google make qrcode). This one points at this website. You can encode more or less anything in them, but the more text you encode, the bigger they get. They max out at 255 characters.